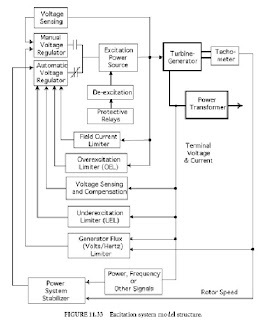 The excitation system provides the DC voltage to the field winding of the generator and modulates this voltage for control purposes. There are many different configurations and designs of excitation systems. Stability programs usually include a variety of models capable of representing most systems. These models normally include the IEEE standard excitation system models, described in IEEE Standard 421.5 (1992). Reference should be made to that document for a description of the various models and typical data for commonly used excitation system designs. The excitation system consists of several subsystems, as shown in Fig. 11.33. The excitation power source provides the DC voltage and current at the levels required by the generator field. The excitation power may be provided by a rotating exciter, either a DC generator or an AC generator (alternator) and rectifier combination, or by rectifiers supplied from the generator terminals (or other AC source). Excitation systems with these power sources are often classified as “DC,” “AC,” and “static,” respectively. The maximum (ceiling) field voltage available from the excitation power source is an important parameter. Depending on the type of system, this ceiling voltage may be affected by the magnitude of the field current or the generator terminal voltage, and this dependency must be modeled since these values may change significantly during a disturbance. The automatic voltage regulator (AVR) provides for control of the terminal voltage of the generator by changing the generator field voltage. There are a variety of designs for the AVR, including various means of ensuring stable response to transient changes in terminal voltage. The speed with which the field voltage can be changed is an important characteristic of the system. 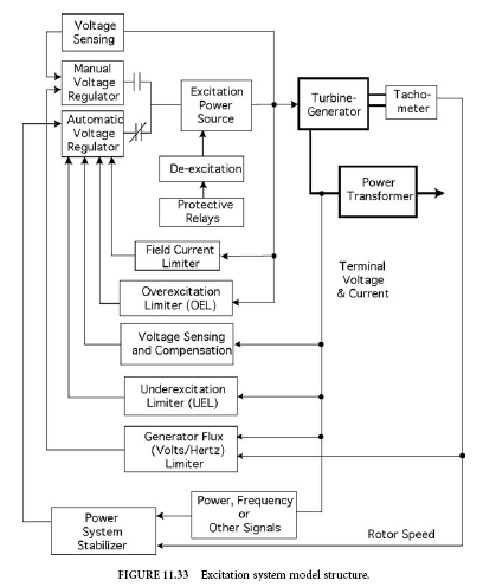 For the “DC” and most of the “AC” excitation systems, the AVR controls the field of the exciter. Therefore, the speed of response is limited by the exciter’s time constant. The speed of response of excitation systems is characterized according to IEEE Standard 421.2 (1990). A power system stabilizer (PSS) is frequently, but not always, included in an excitation system. It is designed to modulate the AVR input in such a manner as to contribute damping to intermachine oscillations. The input to the PSS may be generator rotor speed, electrical power, or other signals. The PSS usually is designed with linear transfer functions whose parameters are tuned to produce positive damping for the range of oscillation frequencies of concern. It is important that reasonably correct values be used for these parameters. The output of the PSS is limited, usually to ±5% of rated generator terminal voltage, and this limit value must be included in the model. The excitation system includes several other subsystems designed to protect the generator and excitation system from excessive duty under abnormal operating conditions. Normally, these limiters and protective modules do not come into play for analysis of transient and oscillatory stability. However, for longer-term simulations, particularly related to voltage instability, overexcitation limiters (OEL) and under-excitation limiters (UEL) may need to be modeled. While there are many designs for these limiters, typical systems are described in IEEE Trans. (Dec. and Sept., 1995).